A native of Cleveland’s west side, Falcone- Hall is currently the director of the Western Reserve Historical Society. Following high school Falcone-Hall initially attended Eastern Michigan University before transferring to CSU in the fall of 1989. After finishing her BA she continued her education at CSU, earning her MA in history. After graduation Falcone-Hall took a position at WRHS working in the manuscript library before transferring to the society’s satellite location, Hale Farm. 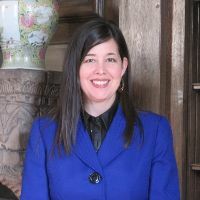 After rising to director at Hale Farm she once again returned to Cleveland where she held multiple positions at WRHS before being named director in 2014. Of particular interest is Falcone-Halls description of CSU’s campus in the early 1990s, her description of the history department’s faculty that served during that time, and her personal account of her trajectory while working at WRHS. She will be giving a talk titled “2016 National Republican Convention”.